I am on what seems like a permanent quest to find the perfect shampoo/conditioner combination that’s going to make a visible difference to my hair from the first wash, some may call this wishful thinking but you can’t blame a girl for trying eh? After using these hairy treats from Fushi, I can definitely say that I may well have found what I’ve been hunting for! 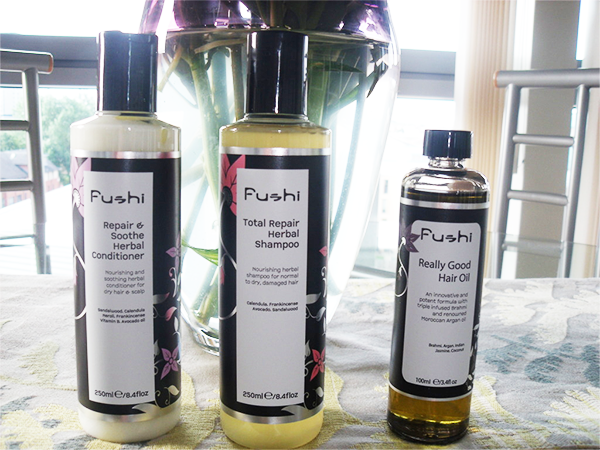 Fushi are the epitome of natural and organic, all there lovely products are 100% natural and contain no nasties, I personally had never tried completely natural hair care so was intrigued to try these out. So the first thing I tried was the shampoo and conditioner, the total repair shampoo smelt great and left my dry hair feeling really clean, but not like it had been stripped of all it’s moisture (which is how the majority of shampoos tend to leave my hair feeling). It lathered up a treat and rinsed out easily, another point to note with this is that although its quite pricey, a little went a long way and I have really thick long hair which can easily soak up half a bottle of shampoo! I followed the shampoo with the repair and soothe conditioner which didn’t feel as thick as I thought it would, this worried me slightly as usually my hair responds best to a thick creamy conditioner, but this was light and felt really clean and fresh in my hair, I left it on for a few moments and then rinsed it out and my hair instantly felt like silk! All I added after this was some heat protection spray and then gave my hair a quick blow dry…and wow, my hair had never ever looked healthier, glossier or smoother. I was so surprised that my usual frizzy dry hair didn’t even need to be straightened or styled. I’ve used this shampoo and conditioner combination four times now and I can honestly say I love it, nothing else I have ever tried compares to this. My only teeny weeny moan about these is the amount you get for the price, call me cheap but if I’m paying £15-£18 for a shampoo/conditioner I would like maybe a little more product for my money as these are quite small, but on the plus side they are so worth it in terms of results! I’ve tried the hair oil twice, each time in a different way. The first time I tried the oil I massaged a small amount into my scalp and wrapped my hair in a hot towel and left it for around two hours, and then washed and styled my hair as normal. I really noticed an improved shine to my hair after doing this and my scalp felt really fresh. The second time I tried this I used it in the same way but didn't wrap it in a towel, I just put my hair up in a top knot afterwards and left the oil in my scalp overnight, in the morning when I washed the product out my hair looked like silk, it was lovely! I don’t know if this is good enough to replace my Morrocan Oil but it’s definitely worth a try! Well that’s my round up of organic hairy treats, have you guys tried any Fushi products? I’d love to hear your thoughts on them!